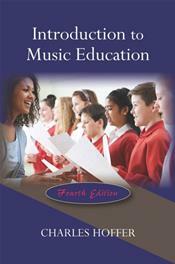 The streamlined Fourth Edition of this widely adopted text introduces prospective school music teachers to the profession of music education by one of the field's respected senior practitioners. In a warm, approachable style, Hoffer presents a working repertoire of concepts and general information, gets readers thinking about music teaching, and encourages them to examine themselves in terms of their future roles as educators in the field. Introduction to Music Education, 4/E provides a comprehensive, straightforward overview of the field, including its opportunities and its challenges. The text is written for a general music education course that precedes methods courses in which prospective teachers learn techniques for teaching various aspects of music. In addition to Hoffer's uncluttered discussions of the nature of teaching, teachers, and music, useful chapter components such as questions for discussion and projects are included.